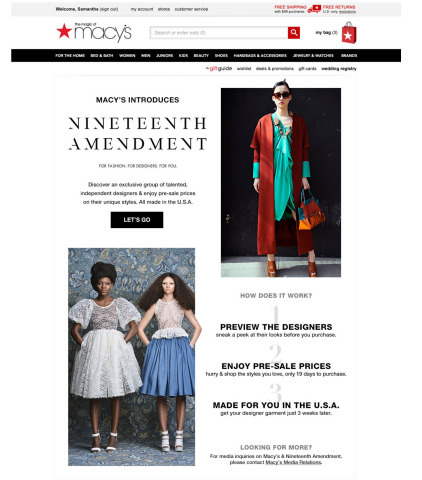 online fashion tech start-up company Nineteenth Amendment on macys.com. Fashion Tech Lab in 2014.
risk-free way to come to market,” said Terry Lundgren, Macy’s, Inc.
business model built for the digital age, while helping to grow U.S.
said Nineteenth Amendment co-founders Amanda Curtis and Gemma Sole. Springboard Enterprises and major fashion retailers, including Macy’s. about Nineteen Amendment, please visit macys.com/nineteenthamendment.